People from quite a distance came out on a cold winter day to hear Roger speak. 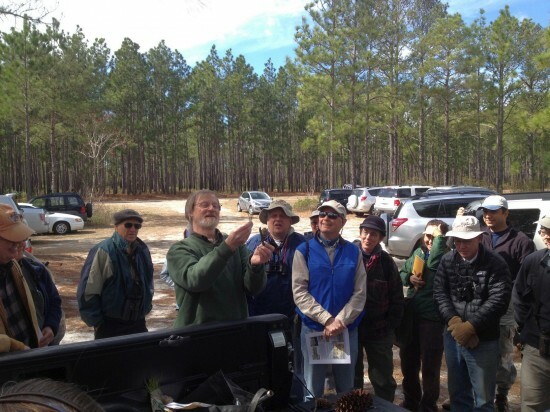 He gave us an overview of the geology underlying Green Swamp. Green Swamp lies on the Penholloway Terrace, one of the beach ledges formed by falling ocean levels thousands of years ago. Where there were accumulations of silt and organic matter, layers of clay formed that now effectively hold the water close to the surface. These form pocosins on what is now relatively high land, pocosin being an Indian word meaning "swamp on a hill". 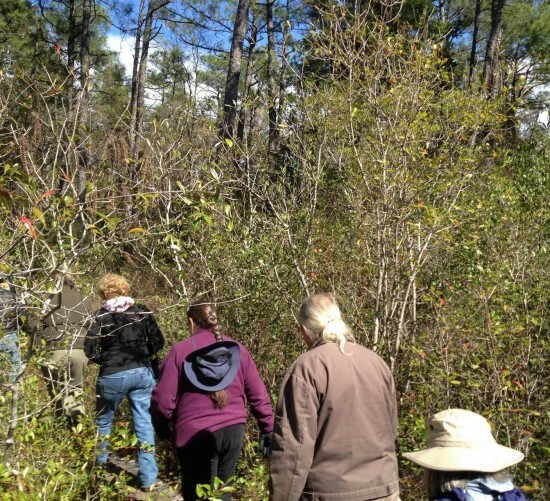 Where sand accumulated, you have now the sandy ridges with their longleaf pine/turkey oak habitat. Thanks to Lois Somers for the photograph. The needles of various pine species differ in the number of needles bundled together in a sheath, the length of the needles, and whether they are straight or twisted. Slash Pine (Pinus elliottii) has both two and three needle bundles, 7-12" long. 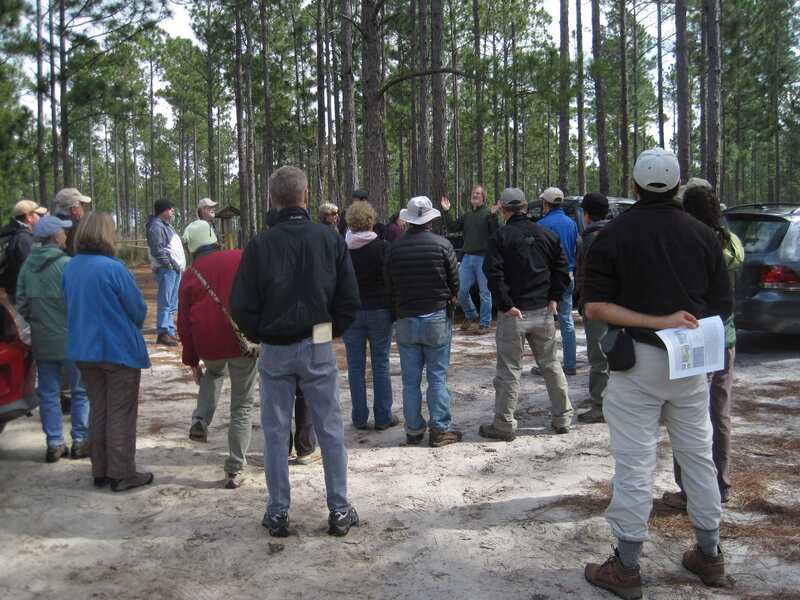 Longleaf Pine (Pinus palustris) has 10-18" needles in bundles of 3. 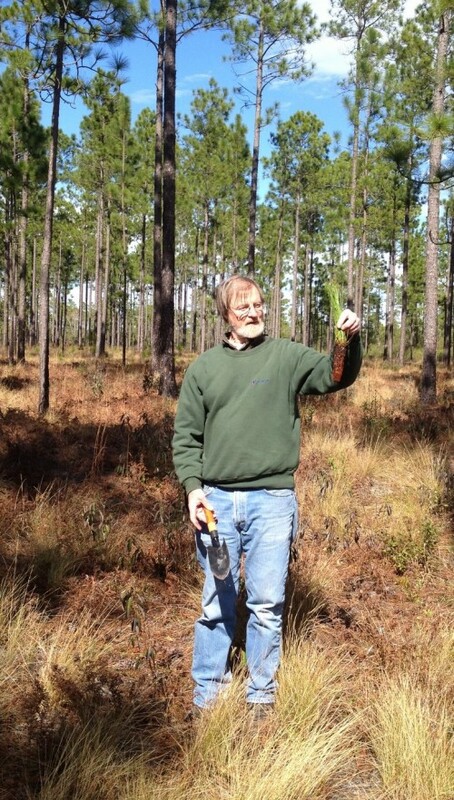 Loblolly (Pinus taeda) has 6-9" needles, all in bundles of 3. 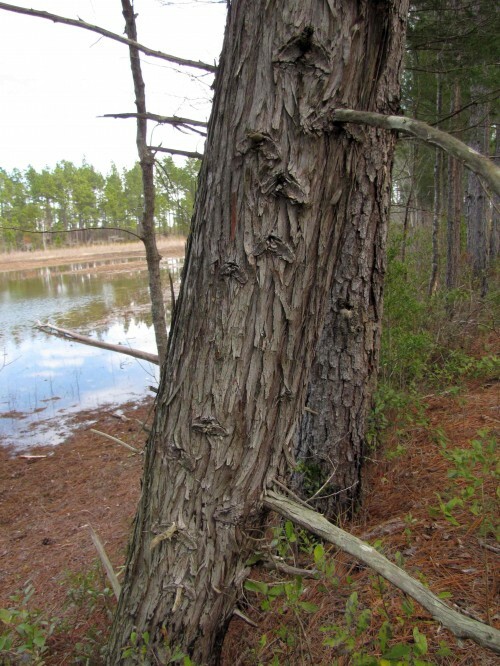 Pond Pine (Pinus serotina) has 5-8" yellow-green needles in bundles of 3 or 4. 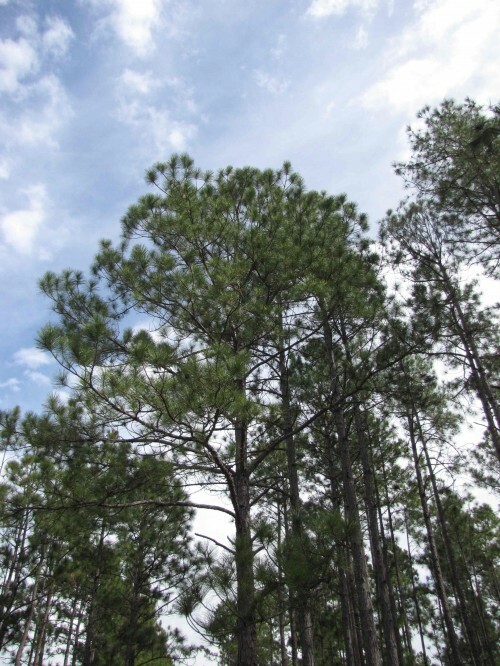 Slash Pine, native from s. South Carolina south along the coast, closely resembles Loblolly Pine (P. taeda) and like Loblolly, it's often planted as a tree crop. It was planted in Green Swamp but performs poorly in NC. You can see it by the parking lot where it has been thinned for eventual conversion to Longleaf. Once a common and valuable timber tree but now uncommon due to over-harvesting, Atlantic White Cedar, with its distinctive bark, can be seen at the edge of the pond by the parking lot. 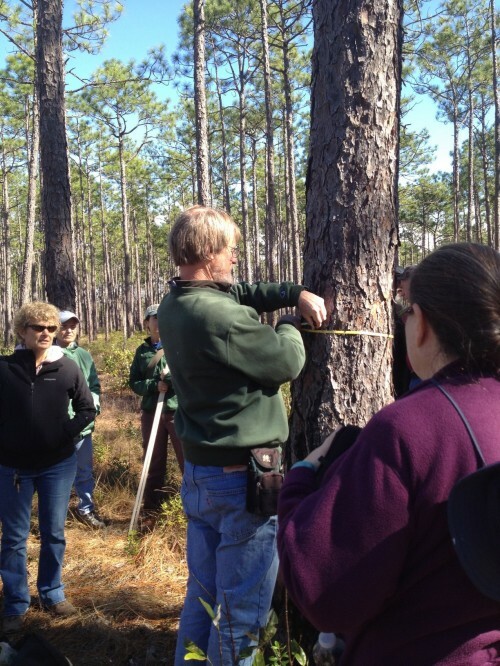 Roger demonstrates how to measure DBH (the diameter of a tree at breast height, 4.5 ft). Using standards for individual species in a particular region, the tree's age can be roughly estimated from its DBH. 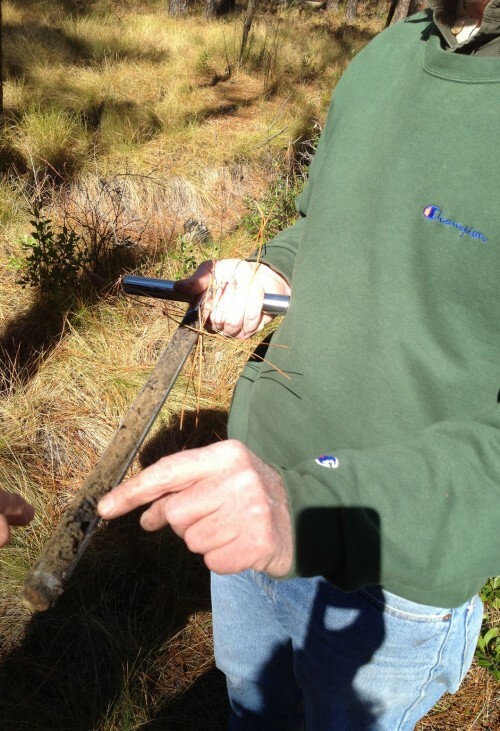 Roger demonstrates how longleaf restoration is done, beginning with seedlings raised in nurseries as plugs. It is important to plant at the correct depth to keep the seedlings from drying out. 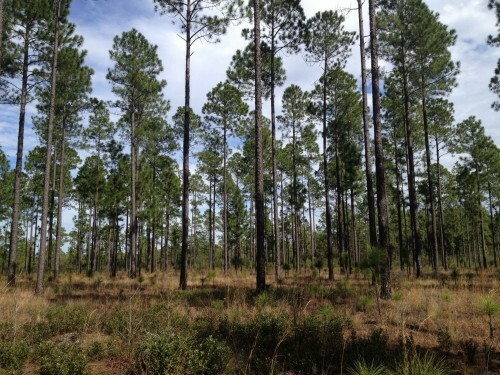 Longleaf pine and wiregrass habitats are maintained by fire. 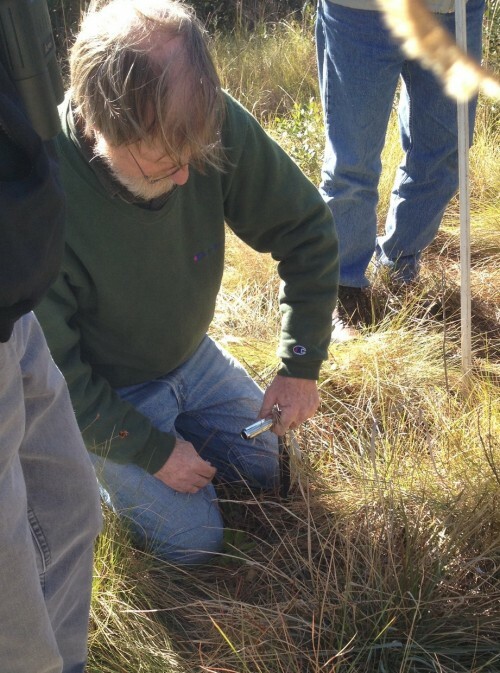 Longleaf stays in the "grass stage" for 1-7 years putting down a deep taproot. During this time, the apical bud is low and survives a normal burn. After this, the tree shoots up quickly until it is above a low fire. 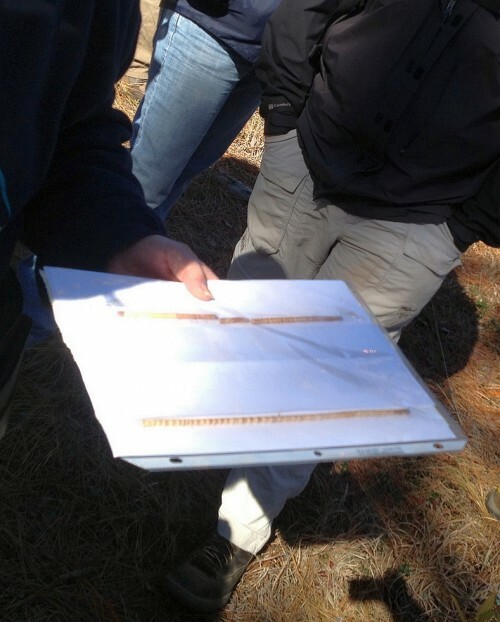 Longleaf depends on fire to bare the soil for its seeds to germinate. 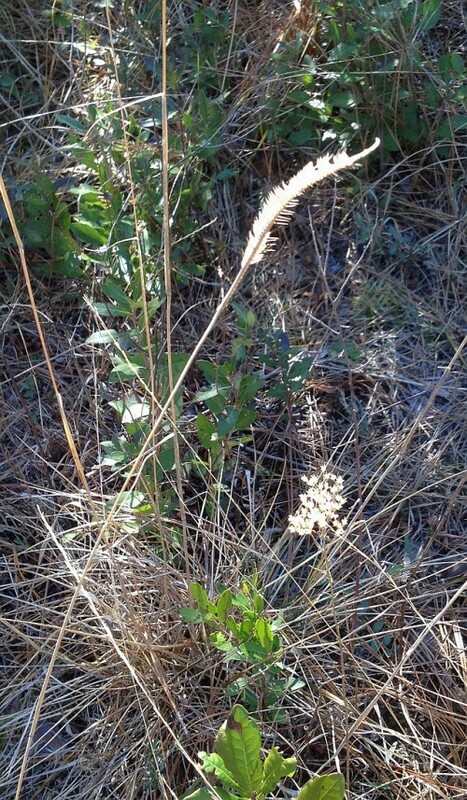 Wiregrass, unburned, becomes too thick to allow regeneration by seed. 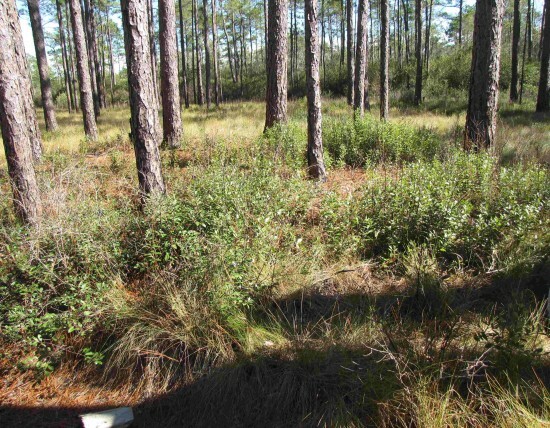 Wiregrass too depends on fire as it only sets seed after burns. These areas were important for the naval stores industry which has left its mark on the landscape, converting what was an extensive southeast habitat into a rare ecosystem sheltering endangered species such as the Red-cockaded Woodpecker and Venus Flytrap. Tapping longleaf pine for turpentine brought settlers their needed income since the land was not especially fertile for agriculture. A box was cut in the tree, shaped to hold about a quart of sap that would be emptied when full. Tar was produced from the heartwood in kilns, the remains of which are still visible. Workers made a U-shaped ditch lined with clay, using the soil to make a mound of alternating layers of soil and heartwood pieces. This was set on fire and the slow burn caused the tar to flow out from the heartwood. Here, the original u-shaped mound is still visible by the change in vegeation caused by its slightly higher elevation. Soils have been classified into many types depending on the proportions of organic matter, mineral content and particle size. 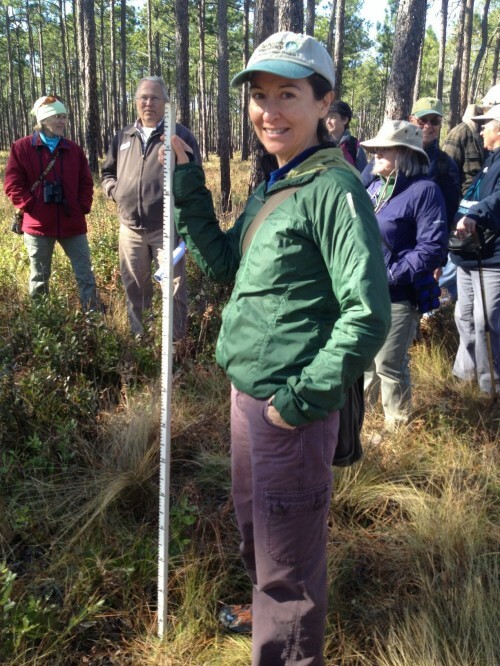 In Green Swamp, they differ over short distances and help determine what plants grow in a given area. Balls of hardened clay show where the clay used to line the trough has been hardened by fire. 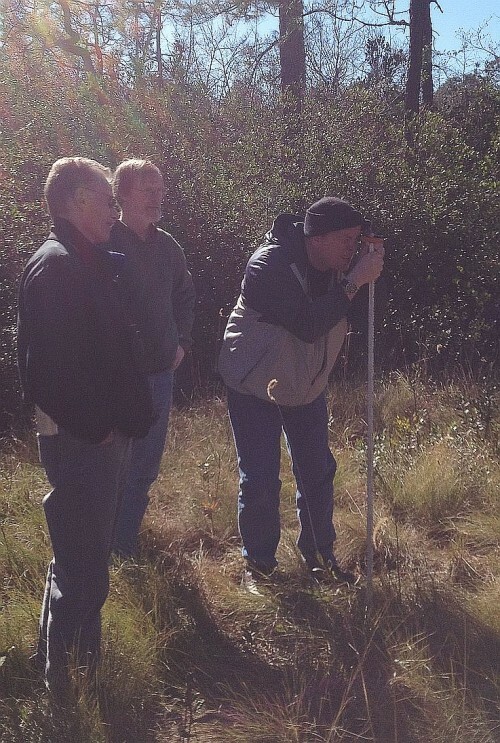 Here we are measuring the change in elevation between the middle of the savanna (next photo) and the pocosin edge. 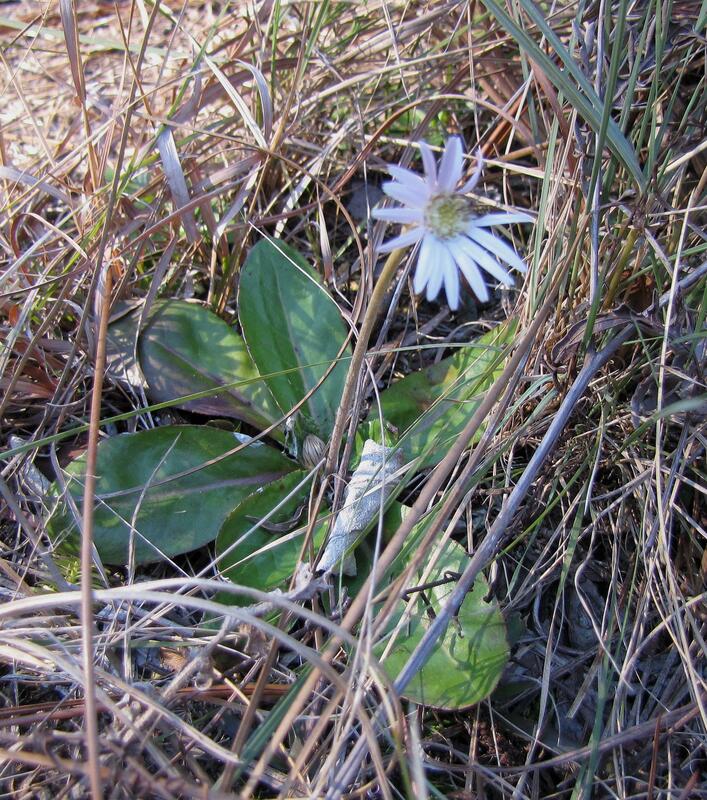 From this high point in the savanna to the pocosin edge in the previous photo, the elevation drops less than a meter but the soils and plants are completely different. 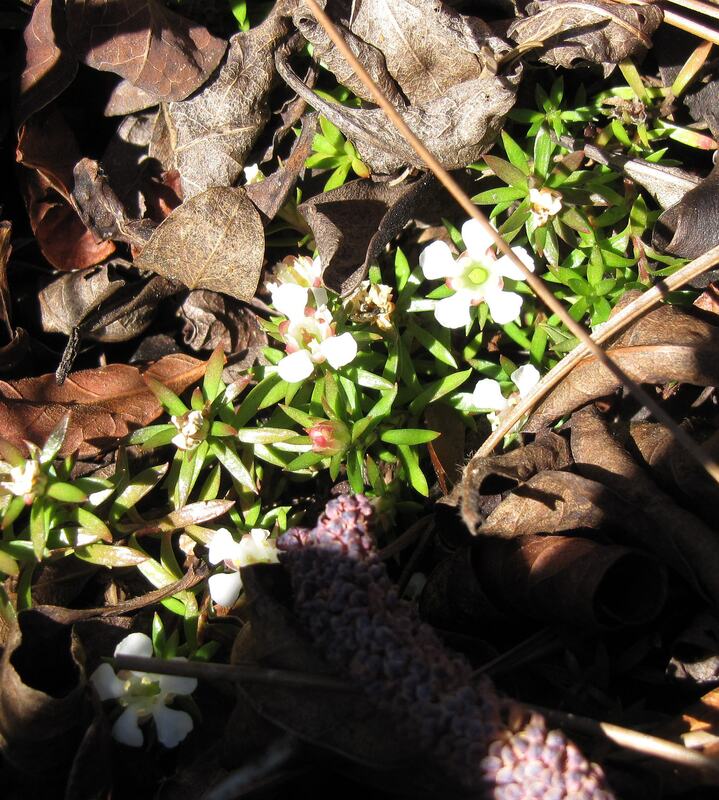 Click on the photo to see these beautiful flowers up close!